Dredd and a ragtag band (including an angry weirdo who seems to have bad intentions) bike across the Cursed Earth in search of a plot device, encountering one parody of American excess after another, as well as a flashback to the beginning of the war that made Dredd's world the way it is: where have we seen this story before? 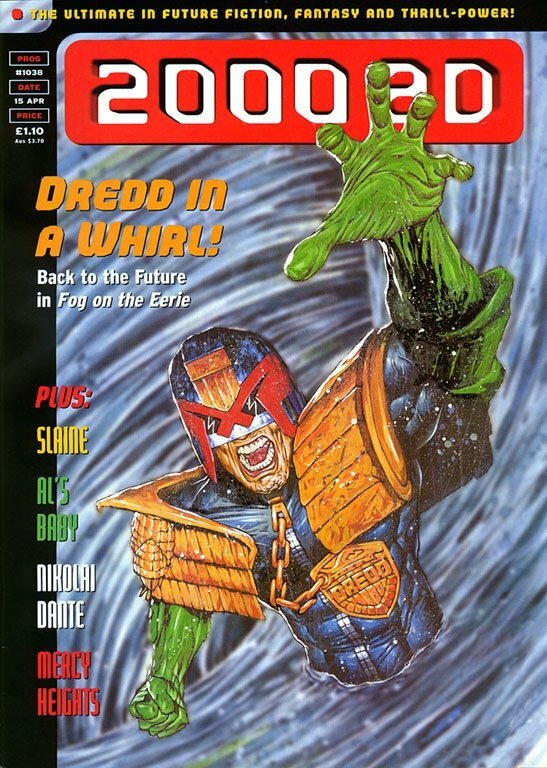 The Hunting Party was evidently planned as a return visit to "The Cursed Earth," fifteen years or so later, with John Wagner at the wheel rather than Pat Mills, and it's not the only new take on an old Dredd template Wagner has written: 2000's "Dead Ringer" is a deliberate variation on "The Judge Child Quest." The Hunting Party recalls the first few years' worth of Dredd stories more generally, as well as the tone of the comics that surrounded them: how are the dune sharks supposed to act in the story, if not to call back to Hook Jaw by way of Flesh? And the extremely broad riffs on staples of Americana--Main Street USA-type patriotic peacocking as literal cannibalism, summer camp as paramilitary brainwashing, fetishizing virginity as disgusting human sacrifice--often seem like the sort of thing that would have been assigned to Ron Smith to draw in the Wagner/Grant era. Smith actually did get to draw "The Black Plague," an arachno-fest on the order of this volume's "Dance of the Spider Queen." The Hunting Party also seems to have had some difficulty getting off the ground. The bulk of it is pretty clearly supposed to follow on immediately from "The Pack," but the final episode of that introductory story as published suggests that maybe Dredd and company will figure out where the deadly land sharks are coming from when they get around to it. 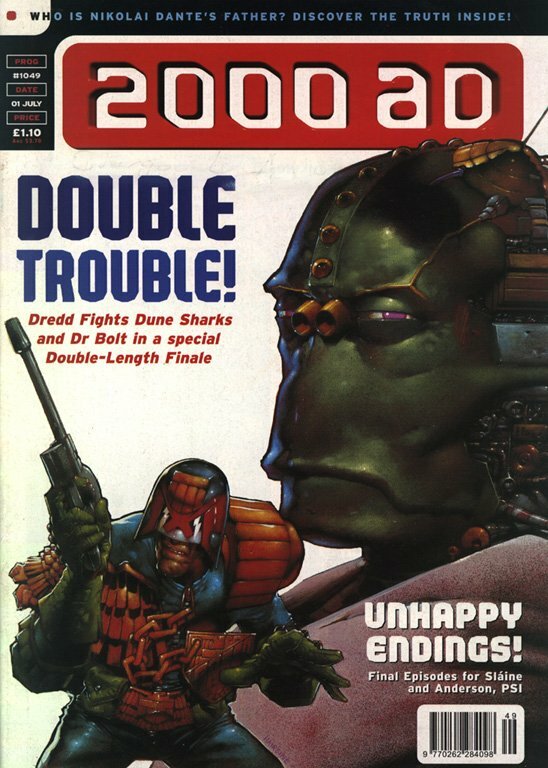 Instead, it was followed by the 12-episode "Darkside"--which I believe was repurposed from a 6-part serial John Smith had written for the Megazine--as well as a Mark Millar-written two-parter that seems to have been sitting around forever and the evergreen "Lonesome Dave," before it got back on track with its single Sean Phillips-drawn episode. 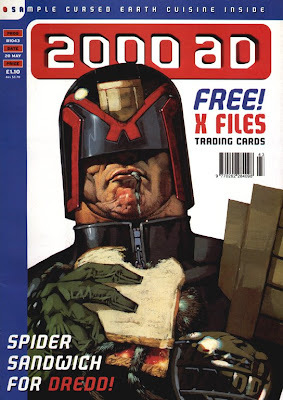 The episodic form of the story allowed six different artists, half of them new to Dredd in the weekly, to draw different parts of it without the jarring effect that had had in, for instance, The Pit. Despite its generally superior craft, though, The Hunting Party isn't nearly as much fun as The Cursed Earth, mostly because Wagner visibly loses interest partway through it. It's set up to be another ensemble adventure of the Wilderlands sort, with Dredd commanding the crew of Renga (who needs a brain and a heart), Bodine (who needs courage), Washington and Stark (both of whom need personalities), as well as DeMarco, who'd been such a lively presence in The Pit. But the supporting cast adds so little to the proceedings that Dredd dumps most of them off 2/3 of the way through the story so Wagner can get through the final few segments without having to account for them all. The most jolting bump in this volume is the "Fog on the Eerie" sequence. It's where Wagner blooded one of those artistic cadets, Calum Alexander Watt, who'd drawn a story in the 1995 Winter Special and only stuck around for one later story (the unreprinted "Spooks," in Progs 1058-1061). Watt has a nice way with photo-based figure rendering, but doesn't make anything look the slightest bit larger than life--the final episode has what may be the most unconvincing representation of a crowd being hit by a nuclear explosion that I can imagine. He also makes the world of 2070 look exactly like the world of 1997. "The Cursed Earth" established that the Judge system was well in place by the time of the Atomic War, helmets and all (Dredd, remember, got his full eagle in 2079), but the Judges of Erie's past just look like contemporary cops, and their cars pose precisely the "contemporary vehicles in a future context" problem that Wagner has mentioned as his one remaining quibble with the new Dredd movie. Also, that panel with the Erie Echo's advertising placard showing the headline "Nukes to Fly Today"? That's not just 1997, that's what newspaper publicity looked like in 1997 in the U.K.--American papers don't advertise like that. It's interesting, and a little jarring, to return to the image of President Booth sending off his nukes (for what the story implies are frivolous reasons) now that we've seen Dredd give orders to atomize half of what's left of the planet. Back in "The Cursed Earth," we Dredd gave his big speech about how "a man like President Booth who causes the blood of millions to be spilt--he's a vampire who puts even Count Dracula in the shade!" This time he calls Booth a "madman," but he's pretty inured to blood-spilling, even slaughtering the 2070 Judges for the sake of expediency. "Fog" appeared only a couple of years after the previous "Dredd visits the past" story: "The Exterminator," serialized 1994-1995, a variation on The Terminator (of course) in which he travels to the New York City of October, 2001 (!!) and is essentially a serial killer. After "Fog," though, The Hunting Party never quite recovers. The "Shark Country" sequence suffers from inappropriate art by David Bircham, a funny caricaturist and very weak storyteller whose episodes kind of look like a MAD magazine parody of Judge Dredd. Jason Brashill's art on "Camp Demento" plays it a little straighter with most of the Judges, although he lets his carefully modeled coloring substitute for showing what's actually supposed to be seen on-panel. (The sequence where the previously timid Bodine snaps, counterattacks and kills Demento is meant to be a big payoff, but Brashill renders it all as extreme close-ups, sound effects and distant silhouettes; I had to read it a few times to figure out what was happening.) And the final sequence has an air of "let's just get this over with" about it: the answers to "what are dune sharks doing on Earth?" and "why did they attack Mega-City One?" turn out to be "we don't know" and "probably something to do with McGruder--you ask too many questions." So what The Hunting Party is most notable for, in the context of the whole series, is the arrival of artist Henry Flint, who's since become one of the mainstays of Judge Dredd, especially in Day of Chaos. There are hints of great Dredd artists of the past about his early work--Dr. Bolt, in particular, has a real Ian Gibson look about him--and he's even got a little bit of a learning curve on his episodes here (Dredd has two facial expressions, "mouth closed" and "mouth open"). Still, Flint starts out better than many artists ever get, and immediately distinguishes himself with very solid character acting, as well as a willingness to come up with compositions that include insane amounts of detail if it'll communicate necessary plot points or a sense of spectacle. Next week, we'll be seeing a lot more of his work, with The Henry Flint Collection. Are you going to go back and do Complete Case Files 19 now it's out? Yes, probably sometime in the next few weeks. Great blog, Douglas, that manages to make some interesting points concerning a story there's not that much worth saying about. I remember feeling at the time that the time travel device had been used too often and too close together for the strip's own good- there was that Ezquerra-drawn (1995) story, where a bunch of Oxford academics crash land in MC1 too. For exactly the reasons you slate Watt's art- his reliance on photographic reference and inability to draw future tech/fashion- I thought handing him those particular episodes was a canny editorial decision. You make an interesting point regarding such anachronisms, with reference to the forthcoming film, though. Watt's art in 'Perchance to Dream' was far better than what appeared in 'Fog on the Eerie'. For years I thought Watt was a pseudonym of Cam Kennedy's considering how similar the art in Perchance to Dream looked to Cam's. 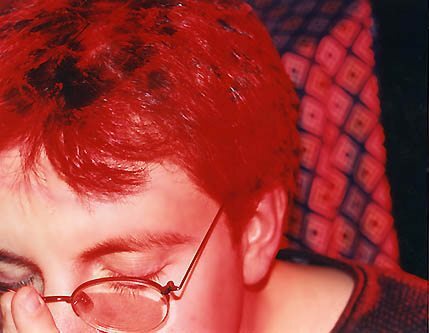 What ever happened to Trevor Harsine? He and Henry Flint were a magnificent duo on Dredd.